Two Saturdays ago, we took off across the bridge and drove up into the mountains with some rented snowshoes and a couple of friends. 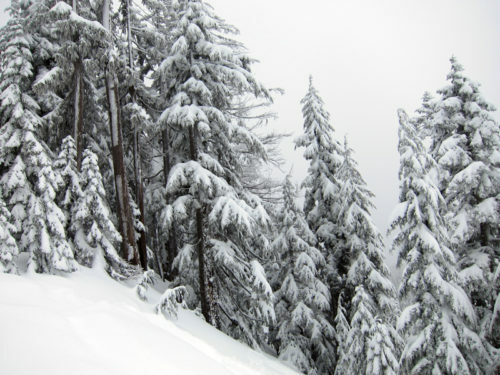 There had been avalanche warnings that morning and I was a teensy bit nervous as we passed the red warning sign at the bottom of the mountain trail, but a few feet into the snow and trees and quiet, and I forgot all about the potential danger. I should point out that we were assured by the employees over at the ski hill that we would be totally fine as long as we stuck to the trails. And we did. Safe & sound! We made it all the way up to the summit and despite it being an overcast day, it was gorgeous – like being stuck inside a snow globe. Quiet and still and despite all the snow, we were warm and sweaty. That’s what a steep climb in snowshoes will do. At the summit we were greeted by a couple of cute fluffy whiskey jacks and the biggest ravens I ever did see. I should point out that cookies involved. These sesame tahini cookies that I had baked up the night before helped to take us up to the summit and kept our energy and spirits up. Cornelius thought they tasted a bit like Christmas shortbread cookies and I know exactly what he means. The texture is delicate and tender and they tasted rich and buttery. Perfect for snacking with a cuppa and a great accompaniment on a snowy climb. 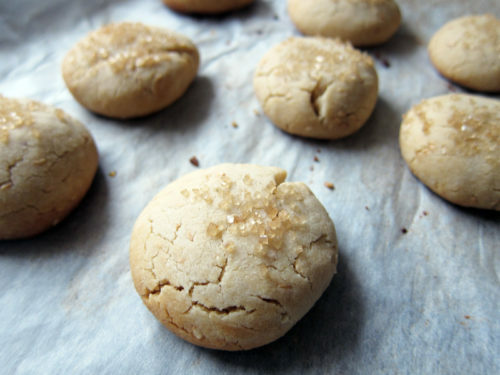 There’s no reason to doubt the awesomeness of tahini in cookies. Plus with the sesame seeds sprinkled throughout and the crunch of the raw sugar on top, these cookies are really easy to fall in love with. However, I should point out that Cornelius nor my friends couldn’t guess what they were made with. I thought the sesame taste was quite evident, but everyone was kind of clueless until I told them. Whateves, my friends clearly have inferior taste buds but they loved these cookies as much as I did. I’m not one to drink milk with cookies, but I think these would make a fine candidate. Got egg issues? No problem because there are no eggs involved. Want to make these vegan? Sub out the honey with agave or maple syrup and use vegan margarine instead. No problemo! elsewhere: Over at Poppytalk, I make a fantastic yam & red quinoa salad. Healthy and packed with nutrients, not only is it gorgeous, but it’s filling and really freakin’ delicious. Get the recipe! In a medium sized bowl, whisk together the flour, baking powder, and salt. In another bowl, combine the butter, sugar, tahini, honey and vanilla until well blended. Add the flour in 2 additions, mixing slowly but surely. Stir in the sesame seeds and when those look combined into the dough, dump the dough onto a sheet of plastic wrap or parchment paper and flatten slightly. Wrap tightly and chill in the fridge for about an hour or so. When the dough is chilled, preheat oven to 350F and move oven racks to the middle. 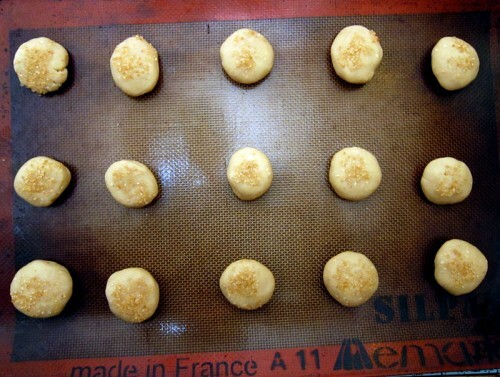 Pour the raw sugar into a small dish and roll out a spoonful of dough, dip into the raw sugar and slightly flatten each ball before setting them onto a silpat or parchment-covered baking sheet. Fill 2 sheets with cookies (don’t worry, the cookies will not spread) and bake for 12-14 minutes until slightly golden and crackly. Cool cookies completely on sheets before transferring, as the cookies are very delicate out of the oven. Makes about 24-28 cookies. These sound so interesting! Rich, buttery and sprinkled with sesame seeds? Sold. 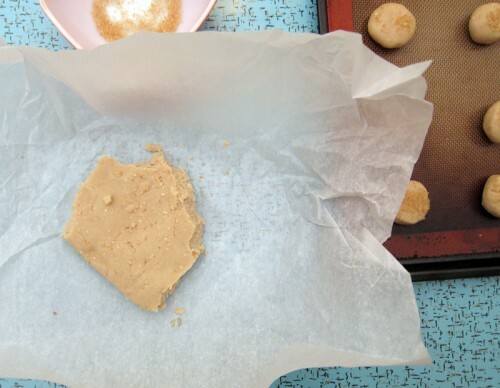 I love the idea of tahini used as a peanut butter alternative in cookies. I always feel like sesame seeds and honey go so well together so I’m sure these are crazy addictive. What intruiguing cookies! I’m gonna have to try this unusual combination, you’ve made me really curious! A few years back we went to a cookie party where everyone was asked to bring a cookie to share with the other guests. I brought a tahini-based cookie. They were coin cookies: first rolled in sesame seeds, chilled, and then sliced and baked. And the cookies were dreadful! They somehow managed to be very salty, lacking any bit of sweetness and definitely not any savory. This recipe looks like one even I couldn’t mess up. Thanks for this. yum yum yum yum … I WILL be making these cookies. I have a large jar of tahini that my mom brought me back from Greece. Wish I could share it with you, it’s toasted tahini butter and the aroma is incredible. These are perfect Lent cookies for fasting as they are vegan and Orthodox Greeks abstain from all animal products during this time of year. Add “Greek lent cookies” to your tags. Unoscoiatt, I hope you do, they’re delicious. Oooh, good to know about these being good for lent. I always buy a big jar of tahini (I think it comes from Montreal) and it’s the best brand I’ve found. I can imagine that yours is incredible!! I just realized I have 2 open jars of tahini so this would be an excellent way to use some of it up! Love how you describe them as shortbread. They sound so good! Another brilliant use for tahini! I thought that these looked familiar! Loved Megan’s post, and love yours. 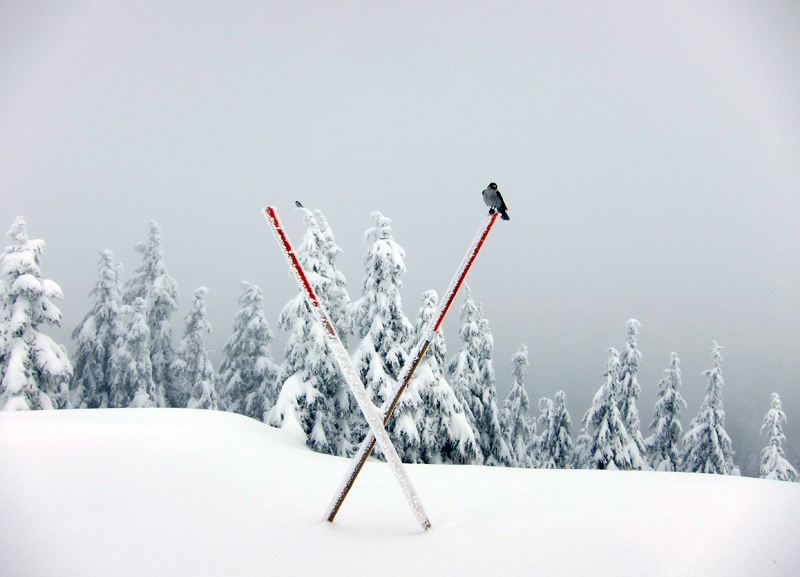 I am so envious of your snowshoeing adventures – I love snowy, wintry landscapes and California’s had so little winter weather this year. I can totally imagine how perfect these were, tucked into pockets and enjoyed on the incline and at the top. Wow, the fact that i cannot image what these taste like means that i’m going to have to bake a batch asap. I can’t wait, thank you. Mmmm, I love sesame! What a great idea to use tahini in cookies. These look scrumptious, and just the thing after a snowy trek. What beautiful landscape– so glad you avoided an avalanche! I made these last night! SUCCESS! I used a chestnut honey and it worked perfectly with the tahini! I am making these today! Hey, did you know that sesame seeds have the most calcium of pretty much anything you can eat? They have more calcium than milk, even. The fact that these are tahini/sesame based makes them not only guilt free, but…well, kinda sorta a very healthy indulgence. Umm…right, onto making my cookies. 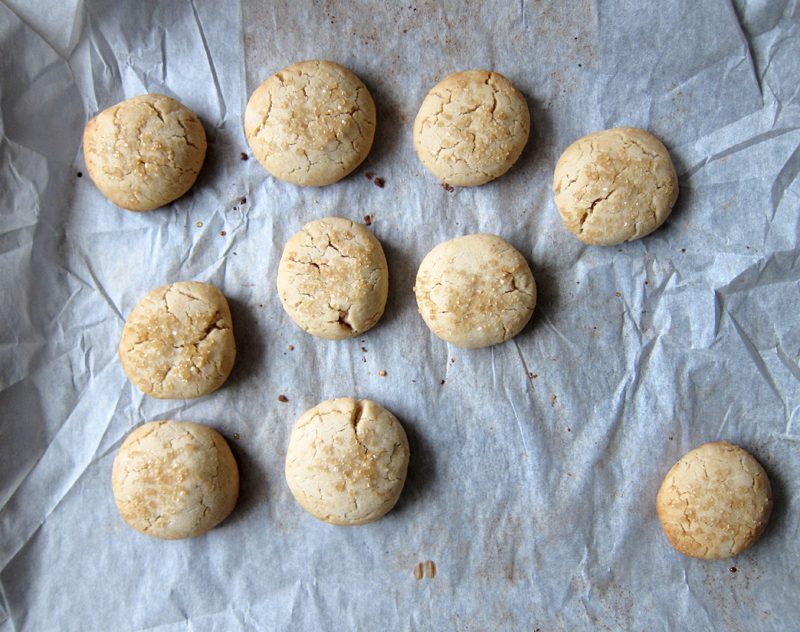 Ashley, yes, so very much like a shortbread but with tahini instead of all that butter. Thanks so much, Kale Crusaders. Ha, you called it Kimberley! These were so good to snack on, en route, but just as nice curled up on the couch recuperating. Sascha, I hope you do. They are very, very lovely. Me too, CozyH! It was scary to see red avalanche signs, but we were in safe hands all along. Phew!! Reale, so glad you enjoyed these. Hooray! Tara, yay! They are perfect, aren’t they. And a nice switch-up from PB. I made these for my poker buddies. They disappeared quickly, upstaging the waxy neon-colored day-old store-bought cookies that some other dude brought. No one could figure out the key ingredient (peanut butter? almonds?). By accident, I made mine larger than yours but they turned out just fine. India Pale Ale may not the best pairing but it worked for me. I don’t cook and I don’t bake and I bought a jar of Tahini thinking it was the same thing as Hummus (I know, pretty bad) anyway I was trying to figure out what to do with it and stumbled on your recipe WhooHoo! I did it YUM! My sig other said good, tastes like a snickerdoodle hahaha. Goes great with cabernet :). Thank you. Do you have any suggestions for a flour substitution? We are avoiding wheat because my toddler cannot tolerate it. Penny, I haven’t tried any non-gluten flours in this cookie, but you might want to give coconut flour a try! Good luck & let me know how it goes. Has anyone tried these with a sugar substitute (like splenda)? recently diagnosed with gestational diabetes but these sound delicious! gng, I haven’t tried baking with splenda but if you do let me know how it turns out!